Bimaxillary protrusion (BMP), a condition characterized by protrusive and proclined upper and lower incisors and an increased procumbency of the lips, is seen in many ethnic groups, especially African-American and Asian population. Despite having a Class I molar relationship and meeting the six keys to normal occlusion, the circumoral convexity and poor facial esthetics generate a negative perception in society leading people to seek straighter profiles. The response of BMP to orthodontic treatment has been evaluated in the previous studies which included Chinese, African-American, Caucasian, Japanese, and Indonesian populations with good results. However, the exact relationship between changes in hard and soft tissues is a debatable issue. The nasolabial angle was found to become more obtuse in some, but no particular change was reported by Bills. Some studies have reported a high degree of correlation between retraction of upper incisors and lip retraction, suggesting a close relationship between soft tissues and the underlying hard tissue.,,, Others reported that a definite proportional change in the soft tissue does not necessarily follow changes in the dentition., Lower lip response to THE orthodontic movement was better than that of upper lip in most of the studies.,, Sharma demonstrated proportionate retraction of skeletal and soft tissue points A and B with slightly better response in upper lip than the lower. The etiology of BMP is multifactorial. Ethnicity, soft tissue covering, skeletal age, treatment, and mechanics will influence the results., Genetic associations found in one population need not necessarily hold true in others. Previous studies evaluating lip profile changes following the treatment of BMP have used Caucasian,, African-American, and Asian, samples with varying results. A retrospective evaluation of changes associated with first premolar extractions in adult females of Karnataka has been reported by Kachiwala et al. The southern states of India are populated by people of Dravidian ethnic origin. This population has a markedly different craniofacial form with deep-set midfacial structures and more protrusive dentitions. BMP is common among these people. The prevalence and response to orthodontic treatment of BMP in this population have not been evaluated to date and would be useful for discerning clinicians. In the treatment of BMP, considerable amount of retraction of incisors following four premolar extractions has been reported by various authors,,,,, utilizing different mechanics such as Begg lightwire technique, edgewise appliance, preadjusted edgewise appliance (PEA) based on Roth philosophy, and also bimaxillary surgeries. The biomechanical principles of retraction are not the same in all these various techniques. PEA described by McLaughlin, Bennett, and Trevisi (MBT) introduced a range of improvements to overcome clinical shortcomings and utilized friction mechanics for the retraction of anterior teeth. Friction mechanics, if poorly managed, may be associated with loss of anchorage and is a challenge to orthodontists. Majority of study designs evaluating response to the treatment of BMP so far were retrospective in nature, utilizing extraction protocols involving four first or second premolars or combinations.,,,, In retrospective cephalometric studies, soft tissue measurements may be confounded by soft tissue activity during imaging. Another problem is that differences would defy interpretation because the patients were systematically different even before any treatment was applied. The skeletal age of the patients in different studies also varied from growing patients,, to adults., Normal growth changes of the nose and chin could also contribute to improvement in profiles. Thus, it can be seen that several variables exist in the previous studies making comparisons difficult. No literature exists regarding the effects of friction mechanics and PEA based on MBT recommendations in the treatment of BMP in Dravidian patients. Hence, the purpose of the present study is to prospectively evaluate the soft and hard tissue responses to orthodontic treatment of BMP in a sample of Dravidian patients with PEA utilizing MBT mechanics after the extraction of four first premolars. Approval from the Institutional Research Board, the Institutional Ethics Committee, and informed consent from the patients were obtained. Sample size was determined using the formula n = (Zα + Zβ)2 SD2 × 2/d2 where Zα = 1.96, Zβ= 0.84 (constant), SD = standard deviation of key variable, d = X1− X2 ×1 = Pretreatment mean of key variable, X2= Posttreatment mean of key variable. From a previous study, the SD of upper incisor protrusion was found to be 2.2. To detect a difference (d) of 1.5 mm before and after treatment, a minimum sample size of 31 was required. Accordingly, 31 adult Dravidian patients with Angle's Class I BMP (25 females and 6 males), reporting to the Department of Orthodontics, Government Dental College, Kozhikode, were recruited for this prospective study. Only consenting adults between the age range of 18–30 years having no dental/craniofacial anomalies or tooth size-arch length discrepancies were included in the study. A maxillary incisor to palatal plane angle >124° and mandibular incisor to mandibular plane angle >104° were also deemed mandatory to be included in this study. Patients with congenitally missing teeth, crowding, or those needing combined surgical and orthodontic treatment were excluded from the study. Following extraction of four first premolars, all patients were treated with the PEA (MBT - 0.022 slot, 3M Unitek). Anchorage was controlled using transpalatal arches, second molar banding, and lingual holding arches. Bite opening curves of Spee were incorporated into the archwire of those who exhibited an excessive overbite at the start of treatment. After leveling and alignment, retraction was carried out using active tie backs. Average treatment time taken was 22 months. Pre- and post-treatment lateral cephalometric radiographs of all the patients were taken with Frankfort horizontal plane parallel to the floor, lips in relaxed position, and teeth in maximum intercuspation. All the radiographs were taken by a trained radiographic technician of the institution using the same cephalostat in a standardized manner. The Plan Meca 2002 CC Proline Cephalostat was used. Lateral cephalograms were hand traced onto 0.003 inch matte acetate paper with a sharpened 2H lead drafting pencil by the same investigator under optimal illumination and landmark identification verified by a third. Bilateral images were bisected and treated as midline structures. Linear measurements were recorded with a digital Vernier caliper (6-inch, 0.01 mm accuracy, 506-196-20 Absolute Digimatic-Digital Caliper, Mitutoyo) and the angular measurement with a semicircular protractor to the nearest 0.5°. Any disparities were addressed by retracing the structure. Pre- and post-treatment measurements were compared. Any increase or decrease in the linear and angular measurements would be marked with a prefix + or −, respectively. To test the reliability, 15 randomly selected cephalograms were retraced after 2 weeks by the same investigator. The level of agreement was evaluated using intraclass correlation coefficient which showed good agreement (nasolabial angle - 0.781, Incisor Mandibular Plane Angle (IMPA) - 0.742, upper incisor protrusion - 0.812, upper lip protrusion - 0.763, lower incisor protrusion - 0.803, lower lip protrusion - 0.773, E line to lower lip - 0.749). 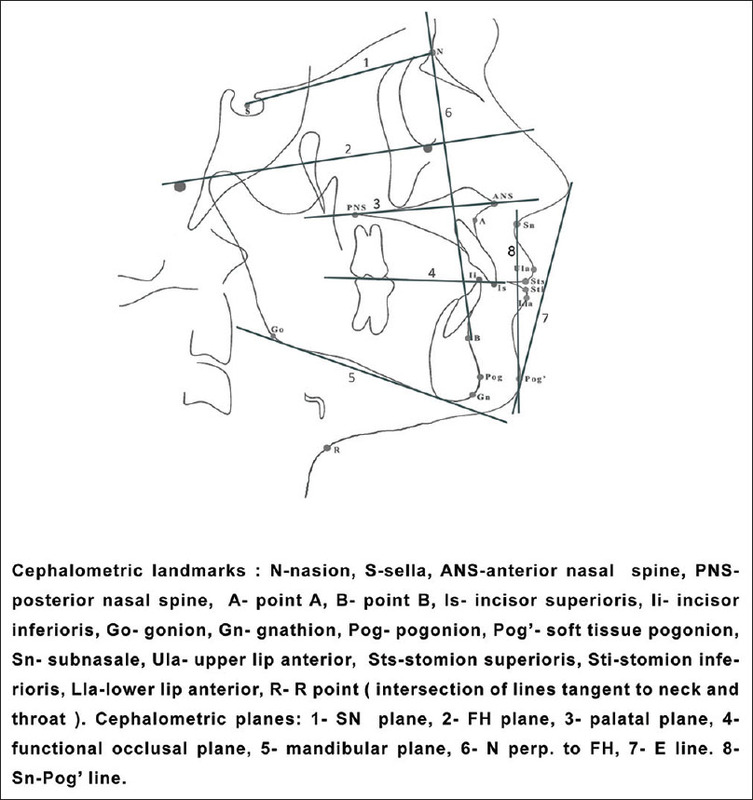 Cephalometric landmarks and planes used in the study are given in [Figure 1]. The reference lines used were nasion perpendicular to FH (NFH), subnasale to pogonion (Sn-Pg), and esthetic line (E line). The lines nasion-point A (NA), nasion-point B (NB), and point A-pogonion (A-Pog) were used for linear measurements. 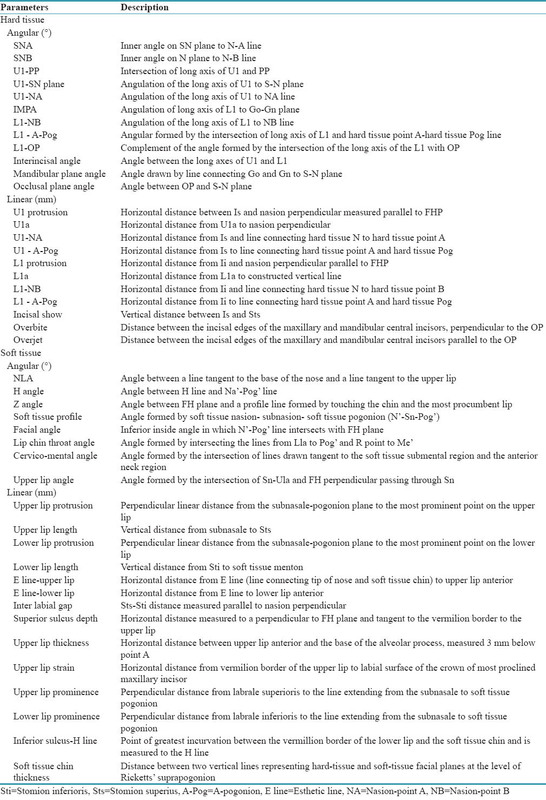 Angular and linear cephalometric measurements comprising 45 variables are given in [Table 1]. All the statistical analyses were performed using SPSS statistical package (Version 13 - SPSS Statistics for Windows, Armonk, NY: IBM Corp.) for Windows. The differences between the pre- and post-treatment results for each of the variables were determined and subjected to paired t-test. Pearson's correlation coefficients were calculated to determine associations between changes in the soft and hard tissues. The level of significance was set at P < 0.05. 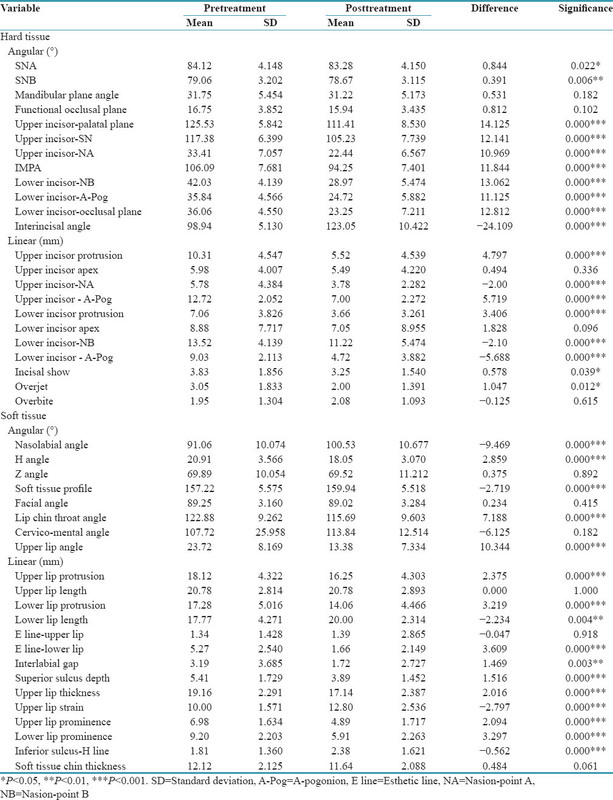 Linear and angular measurements for both hard and soft tissue changes are given in [Table 2]. Statistical significance was evaluated using paired t-test. Analysis of treatment showed that both upper and lower incisors were retracted to a statistically significant degree (P < 0.001). The upper incisor crown tips were retracted significantly by 4.8 mm to the NFH (P < 0.001), 2 mm to the NA line (P < 0.001), and 5.72 mm to the A-Pog line (P < 0.001). The inclination of the upper incisors was also significantly reduced as evidenced by a decrease of 14.13° to the palatal plane (P < 0.001), 12.14° to the SN plane (P < 0.001), and 10.96° to theline NA (P < 0.001). A decrease of 11.84° in IMPA, 13.06° to the NB plane, 11.12° to the A-Pog line, and 12.81° to the occlusal plane was also obtained for the lower incisors, all of which were found to be statistically highly significant (P < 0.001). This increased the interincisal angle, from 98.94° to an acceptable 123.05° (P < 0.001). The lower incisor crown tips retracted significantly by 3.41 mm from NFH (P < 0.001), 2.1 mm from NB line (P < 0.001), and 5.69 mm from A-Pog line (P < 0.001). Significant retraction of Points A and B was obtained as evidenced by a decrease in angle SNA (P < 0.05) and angle SNB (P < 0.01). Though not significant, the apices of both upper and lower incisors also displayed retraction. There was no significant change in the mandibular plane and functional occlusal plane to SN and overbite, but decrease in overjet was statistically significant (P < 0.05). A highly significant retraction of points Ula and Lla was observed after treatment as measured from both Sn-Pog' (P < 0.001) and NFH (P < 0.001). When assessed with the Ricketts' E-plane, the lower lip showed a significant retraction (P < 0.001), but the change in upper lip was insignificant. A significant decrease of 1.52 mm in the upper lip sulcus depth and increase of 0.56 mm in the lower lip sulcus from H-line were observed (P < 0.001). Upper lip strain showed a highly significant change from 10.00 to 12.80 (P < 0.001). The upper lip thickness decreased by 2.02 mm (P < 0.001) and the soft tissue chin thickness also reduced by 0.48 mm. A highly significant increase in mean soft tissue profile angle was observed (P < 0.001). The mean nasolabial angle increased from 91.06° to 100.53° (P < 0.001) and the mean H angle decreased by 2.86° (P < 0.001). Change in the Z angle was insignificant. Highly significant decrease of 10.34° in upper lip angle (P < 0.001) and 7.19° in lip chin throat angle (P < 0.001) was also observed. The soft tissue facial angle and cervico-mental angle did not show any significant change. The interlabial gap was significantly decreased by 1.5° (P < 0.01). The upper lip length did not show a significant change, but the lower lip mean length increased significantly from 17.77 mm to 20.00 mm (P < 0.01). Pearson correlation was performed to calculate the ratio between (1) upper lip and upper incisor retraction, (2) upper incisor retraction and change in nasolabial angle, (3) lower lip and lower incisor retraction, and 4) lower lip and upper incisor retraction. [Table 3] shows the correlation between incisor retraction and soft tissue changes obtained in the study. Significant correlations were obtained between upper incisor retraction and changes in upper and lower lip. Careful selection of adult patients substantially reduced the influence of growth in this sample. Being a prospective study, it was possible to control and standardize many of the variables. All the patients underwent extraction of four first premolars and uniform treatment mechanics. In the present study, orthodontic correction of BMP resulted in favorable hard and soft tissue changes with straightening of the facial profile and improvement in lip posture. Both upper and lower lip protrusions were greatly reduced by means of 2.38 and 3.22 mm, respectively, indicating the effectiveness of the treatment modality. This was similar to Lew's findings. The results obtained by Tan are also comparable for upper lip protrusion, but lesser for the lower. Higher degrees of lip retraction have been reported in a sample of African-American females by Caplan and Shivapuja. However, Diels reported lesser amounts, also among African-Americans, probably due to the fact that his sample comprised growing subjects. A significant amount of retraction of the lower lip to E line (3.6 mm) was obtained. This is in agreement with previous observations. The response of upper lip was insignificant. Decrease of upper lip angle by 10.3° resulted in significant changes in nasolabial angle. From the mean pretreatment value of 91°, it increased to a more esthetic 100.5° producing a mean change of 9.5°. This falls within the 90°–1200 range proposed by Drobocky and Smith. Similar changes have been reported in the previous studies.,,, Higher values were obtained by Kachiwala et al. (15°–20°). However, the results obtained by Bills et al. was not so spectacular (3.1°). The lip chin throat angle was also found to decrease markedly leading to significant improvement in soft tissue profile. The present study showed lengthening of lower lip, with a mean increase of 2.23 mm, but upper lip length remained the same. This was in contrast to various studies which showed lengthening of both upper and lower lips.,, As the incisors retracted, the everted upper and lower lips moved backward toward each other leading to a significant reduction of the interlabial gap from 3.19 mm to 1.72 mm, suggesting an improvement in lip competence. The reduction of the interlabial gap was lesser compared to the study by Lew (4.8 mm) and Kachiwala et al. (4 mm). Other important, significant, and favorable soft tissue responses include decrease in upper lip thickness and improvement in lip strain. The posttreatment reduction in upper lip sulcus depth and improvement in inferior sulcus-H line distance were all highly significant. However, it was not possible to compare these findings with previous studies as no literature exists regarding the nature of these changes in treatment of BMP. The soft tissue changes were accompanied by favorable hard tissue changes. Obviously, they appear to be a reflection of the underlying teeth and alveolar processes supporting Burstone's claim that the lip profile is partly determined by the underlying hard tissues. Both the maxillary and mandibular incisor protrusions were reduced significantly, by 4.8 mm and 3.41 mm, respectively. Previous studies have obtained slightly higher values.,,, Both maxillary and mandibular incisor inclinations improved significantly increasing the interincisal angle from 98.94° to 123.05°. These findings reflect the effectiveness of this treatment modality in BMP. The upper and lower incisor apices were retracted by 0.5 mm and 1.83 mm, respectively. Although insignificant, this indicated their bodily retraction. This was in contrast to the study by Lew which showed slight forward movement of the upper and lower incisor apices, probably due to the tipping movement in Begg mechanotherapy. No other studies have reported changes in incisor apices. An insignificant reduction in overbite was observed and the mean posttreatment value was a favorable 1.09 mm. Apparently, retraction with rectangular wires in MBT technique did not lead to excessive deepening of the bite. Overjet was significantly reduced. There was a reduction of mean incisal show to a posttreatment value of 1.54 mm with mean change of 0.58 mm, which could be attributed to the lower lip lengthening and good vertical control of the maxillary incisors during retraction with the PEA. There was no significant change in the mandibular plane angle and functional occlusal plane angle, indicating effective vertical control. Similar observations have been noted in other studies. In an attempt to establish guidelines for clinical management, many researchers have established ratios, comparing dental movements to soft tissue responses. In the present study, the upper lip to upper incisor retraction was found to be 1:2.01 showing moderate correlation (r = 0.458). In other words, for every 1 mm incisor retraction, the upper lip retracted approximately 0.5 mm. For the lower lip to lower incisor retraction, a ratio of 1:1.06 was obtained which shows that for every 1 mm of lower incisor retraction, the lower lip retracts to the same extent. This agrees with the findings of previous researchers.,, Obviously, the ratios established for Chinese, Caucasian, and African-American, races are applicable for Dravidians also. In BMP, lower lip most often contacts both the lower and upper incisors and would, therefore, be influenced not only by the retraction of the lower incisors but also by the retraction of the upper incisors. In our study, lower lip showed moderate correlation to upper incisor retraction with the ratio 1:1.5 which was significant (r = 0.550). The ratio of upper incisor retraction to change in nasolabial angle obtained in this study was 1:2.02. For every 1 mm of retraction of upper incisor, the nasolabial angle increased by 2°. This negative correlation obtained was higher than the figures reported by Lo and Hunter (1:1.63 degrees) and Talass et al. (1:0.8°) but lesser than that given by Kachiwala et al. (1:2.58). Loss of anchorage was not assessed in this study. Factors such as quality of lip musculature and body mass index which may mask, exaggerate, or reduce treatment changes have not been considered. Control sample was not included as study comprised nongrowing subjects, and it was not necessary to isolate the effects of growth from treatment. PEA using MBT mechanics proved to be very successful in reducing the incisor proclination and protrusion and achieving favorable soft tissue changes such as significant retraction of upper and lower lips; increase in nasolabial angle; decrease in interlabial gap, lip thickness, and circumoral convexity; and improvement in lip strain and lip sulcus depth. Various correlations between incisor retraction and soft tissue parameters were established for the Dravidian population. These data would prove to be useful for clinicians treating BMP in Dravidian population. Bills DA, Handelman CS, BeGole EA. Bimaxillary dentoalveolar protrusion: Traits and orthodontic correction. Angle Orthod 2005;75:333-9. Tan TJ. Profile changes following orthodontic correction of bimaxillary protrusion with a preadjusted edgewise appliance. Int J Adult Orthodon Orthognath Surg 1996;11:239-51. Caplan MJ, Shivapuja PK. The effect of premolar extractions on the soft-tissue profile in adult African American females. Angle Orthod 1997;67:129-36. Bravo LA. Soft tissue facial profile changes after orthodontic treatment with four premolars extracted. Angle Orthod 1994;64:31-42. Kasai K. Soft tissue adaptability to hard tissues in facial profiles. Am J Orthod Dentofacial Orthop 1998;113:674-84. Kusnoto J, Kusnoto H. The effect of anterior tooth retraction on lip position of orthodontically treated adult Indonesians. Am J Orthod Dentofacial Orthop 2001;120:304-7. Diels RM, Kalra V, DeLoach N Jr., Powers M, Nelson SS. Changes in soft tissue profile of African-Americans following extraction treatment. Angle Orthod 1995;65:285-92. Neger M. A quantitative method for the evaluation of the soft tissue facial profile. Am J Orthod 1959;45:738-51. Hershey HG. Incisor tooth retraction and subsequent profile change in postadolescent female patients. Am J Orthod 1972;61:45-54. Talass MF, Talass L, Baker RC. Soft-tissue profile changes resulting from retraction of maxillary incisors. Am J Orthod Dentofacial Orthop 1987;91:385-94. Sharma JN. Skeletal and soft tissue point A and B changes following orthodontic treatment of Nepalese Class I bimaxillary protrusive patients. Angle Orthod 2010;80:91-6. Lew K. Profile changes following orthodontic treatment of bimaxillary protrusion in adults with the Begg appliance. Eur J Orthod 1989;11:375-81. Kachiwala VA, Kalha AS, Machado G. Soft tissue changes associated with first premolar extractions in adult females. Aust Orthod J 2009;25:24-9. Sundareswaran S, Nipun CA. Bridging the gap: Sella turcica in unilateral cleft lip and palate patients. Cleft Palate Craniofac J 2015;52:597-604. Keating PJ. The treatment of bimaxillary protrusion. A cephalometric consideration of changes in the inter-incisal angle and soft tissue profile. Br J Orthod 1986;13:209-20. McLaughlin RP, Bennett J, Trevisi HJ. Systemized Orthodontic Treatment Mechanics. 1st ed. New York: Mosby; 2001. p. 3-15. Nanda R. Biomechanics and Esthetic Strategies in Clinical Orthodontics. 1st ed. Quintessence Publishing Co. Inc, Chicago, US: Elseviers; 2005. p. 71-82. Hagler BL, Lupini J, Johnston LE Jr. Long-term comparison of extraction and nonextraction alternatives in matched samples of African American patients. Am J Orthod Dentofacial Orthop 1998;114:393-403. Drobocky OB, Smith RJ. Changes in facial profile during orthodontic treatment with extraction of four first premolars. Am J Orthod Dentofacial Orthop 1989;95:220-30. Nadkarni PG. Soft tissue profile changes associated with orthognathic surgery for bimaxillary protrusion. J Oral Maxillofac Surg 1986;44:851-4. Burstone CJ. Lip posture and its significance in treatment planning. Am J Orthod 1967;53:262-84. Lo FD, Hunter WS. Changes in nasolabial angle related to maxillary incisor retraction. Am J Orthod 1982;82:384-91.